Sunday Ramblings from Prospect Cottage. The weather this month has been extraordinary. 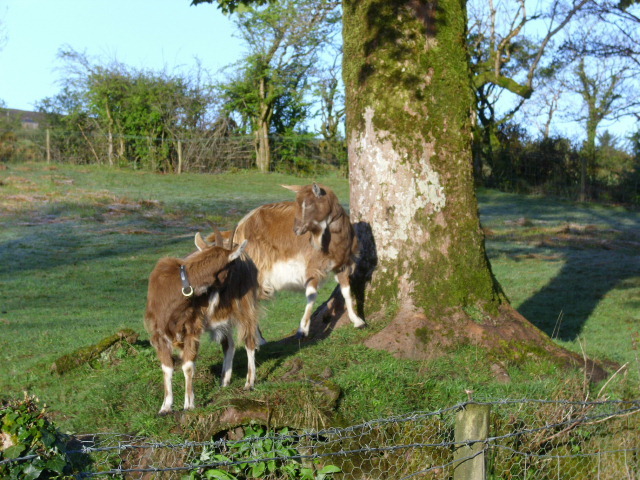 Fluctuating between wet and dry weather but always so mild…springlike actually. 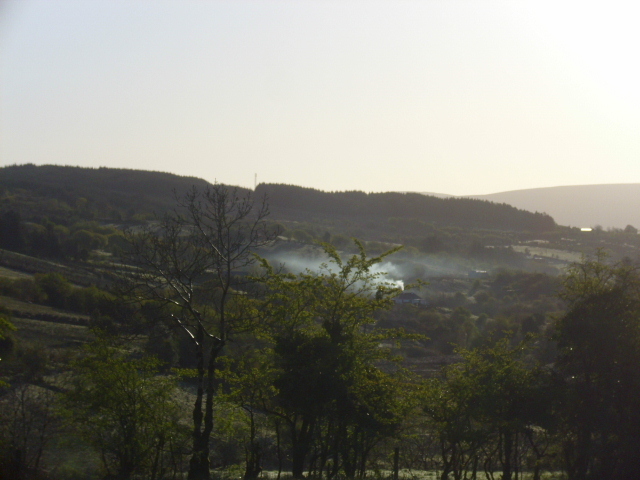 The pic above was taken yesterday…very low cloud on Corry Mountain making the wind turbines invisible. I spent 2 hours in the garden…weeding and tidying up. It was too warm for a coat! 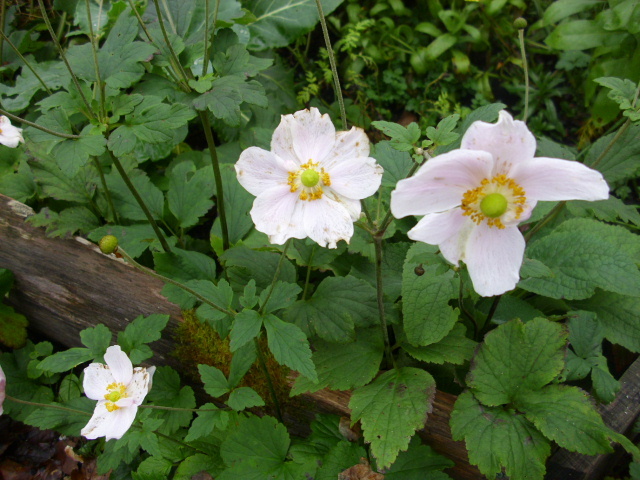 Japenese Anemones continue to produce flowers. Be careful where you plant these as they are impossible to remove and spread like crazy. I thought I had dug them all up from this corner of one of the veg beds…but no…they came back with a vengeance again this year. 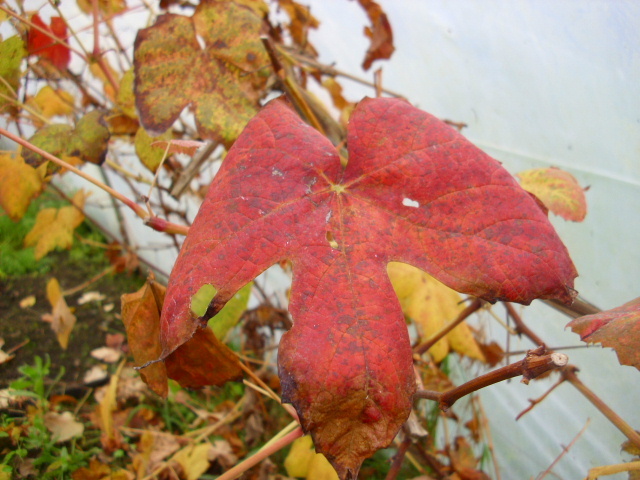 Any little bit of root produces a new plant…a bit like Bindweed. 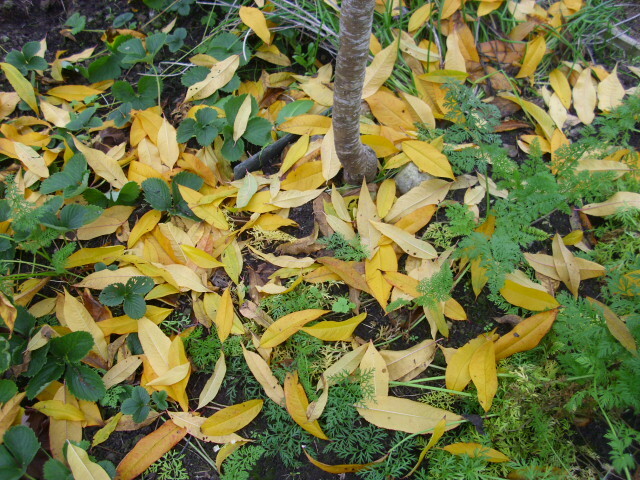 In the polytunnel the Peach tree has dropped most of it’s leaves…making a bright splash of yellow for a short time. I will enjoy this colour for a little while before collecting the leaves for the compost. The Grapevine too will soon be bare. In the kitchen above the stove the last of the grapes are bubbling away… hopefully a nice wine will result. There is still lots of Beetroot to be harvested in the polytunnel. I have made lots of Beetroot Chutney and tried Borscht for the first time earlier this week…delicious. Beetroot is said to have health enhancing properties and contains vitamins A, B1, B2, B3, B5, B6, C, E, K plus calcium, mangenese, potassium, iron, copper, phosphorus, sodium, zinc and selenium. It does’nt have to be eaten from a bath of cheap vinerar only. 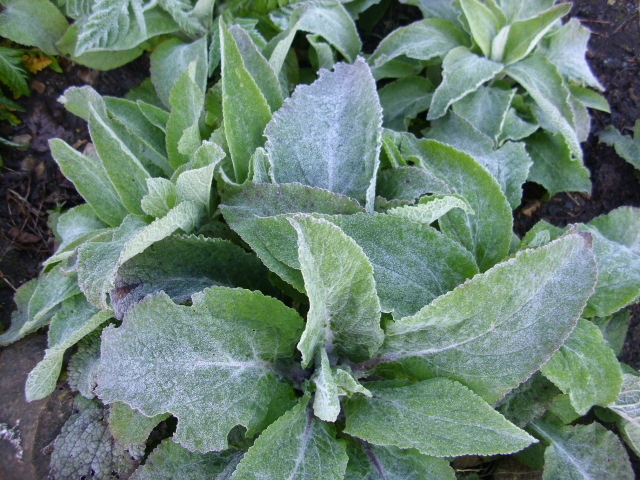 It is delicious roasted…can be grated over salads…makes great soup…and can even be used in cakes. I have a recipe for Chocolate and Beetroot Cake which I intend to make this week. I’m also going to juice some…I’ve had Beetroot juice in the past…it’s very sweet. 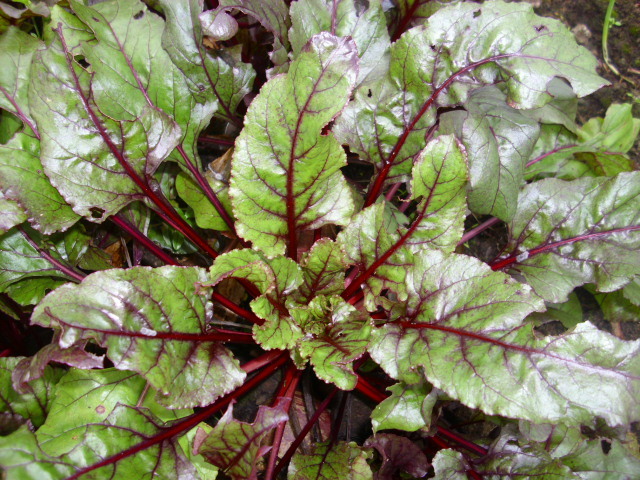 Beetroot is said to provide more oxygen to the blood. So there you go…the humble easy to grow Beetroot is really a superfood. 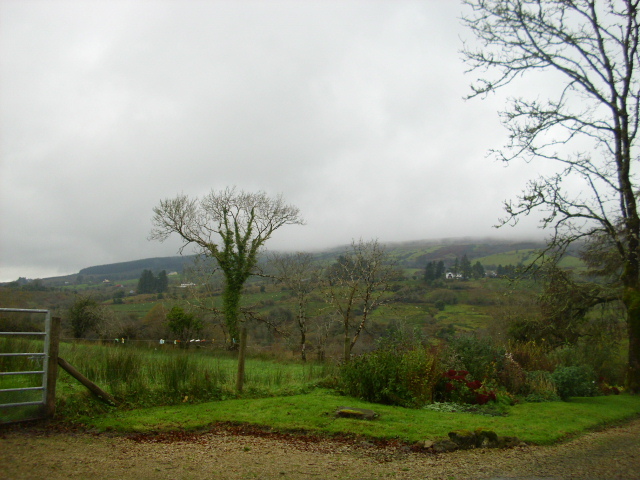 Finally a look at where I do my blogging from…the front porch looks out onto our front field and beyond that to Sliabh an Iriann (the Iron Mountain)which is shrouded in heavy mist today. A comfy chair…bookshelves to my right…I like to check info before I put it out there. 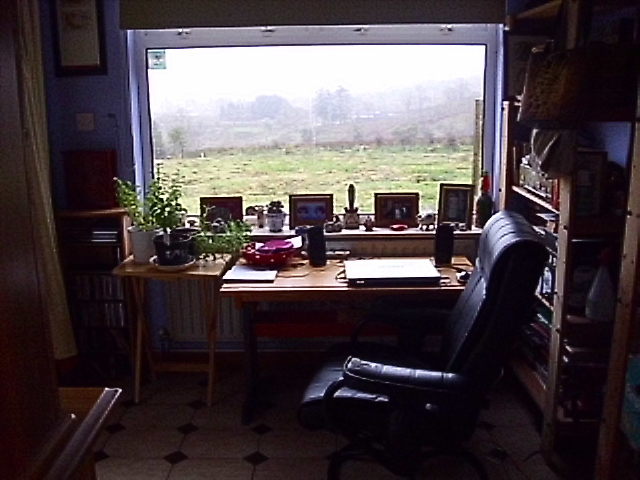 Laptop on desk in front of radiator…cushy. Looking out on our little world whilst communicating with the big wide world out there. Lovin it! 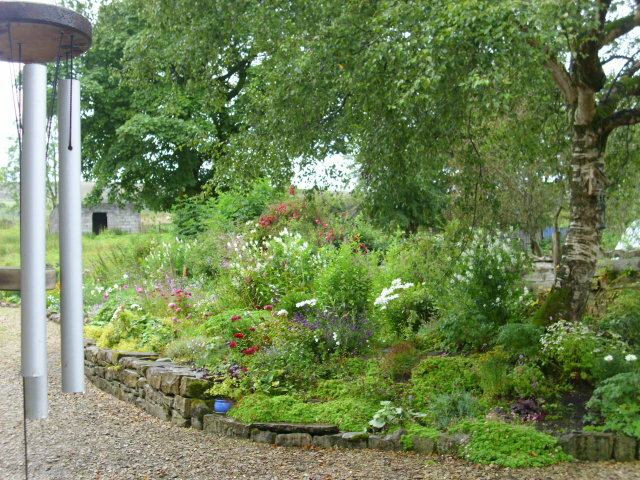 Have been asked by Elaine of www.rosebankramblings.com to show a few pics of the wider view of our place. So here we are, ready for a little tour. 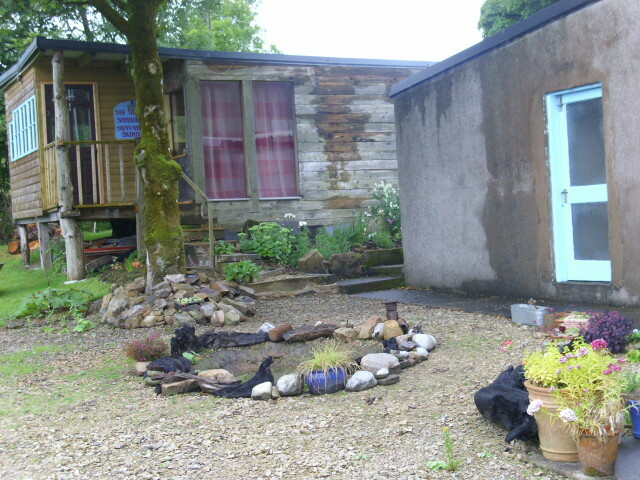 This gravel garden which is in its very early stages, it was only started in April, is still being worked on. This is at the front of the house. Front entrance behind and to right from where I took this pic. The wooden building is a separate building, I will do a post on that soon. 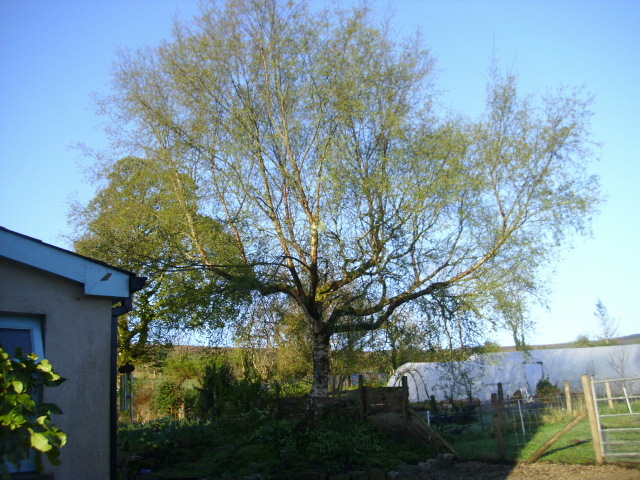 From outside our back door, which is the entrance we use most and where you arrive to the house, looking left there is a big weeping Birch and a cottage garden style flower bed. 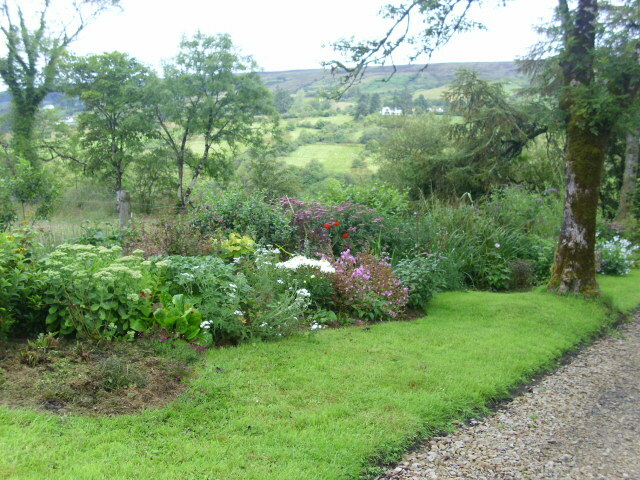 Looking right is the herbaceous border and beyond can be seen Corry mountain. 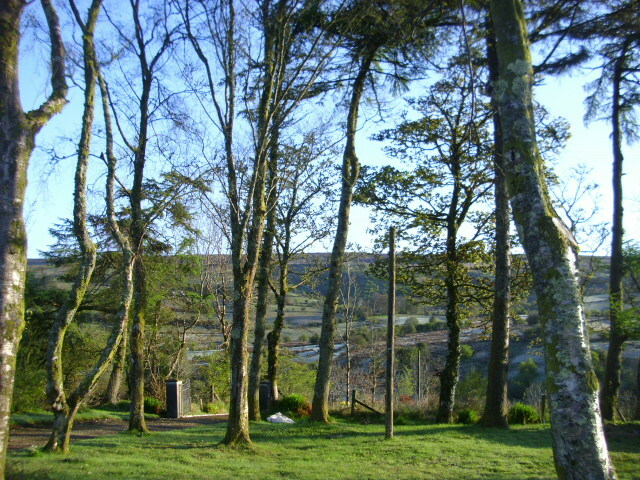 Round the corner of the house is this small grove of trees, Birch, Sycamore and Scots Pine. This is opposite the herbaceous border. 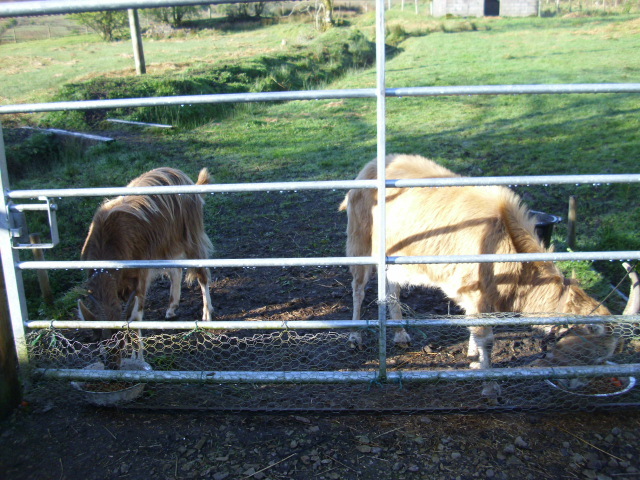 The grass is left uncut, apart from an edging strip, until September. 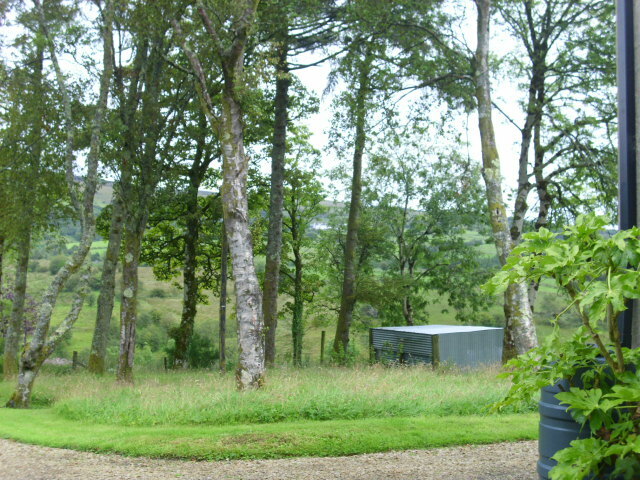 The goat shed can be seen in the field beyond. 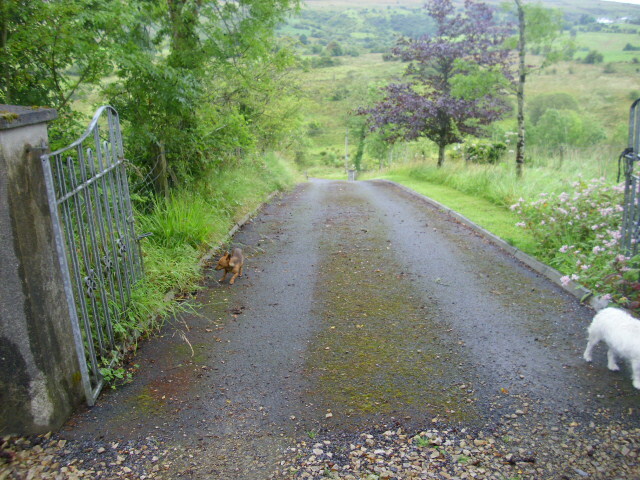 Continuing on to the gate and our steep drive. Decent brakes needed here! 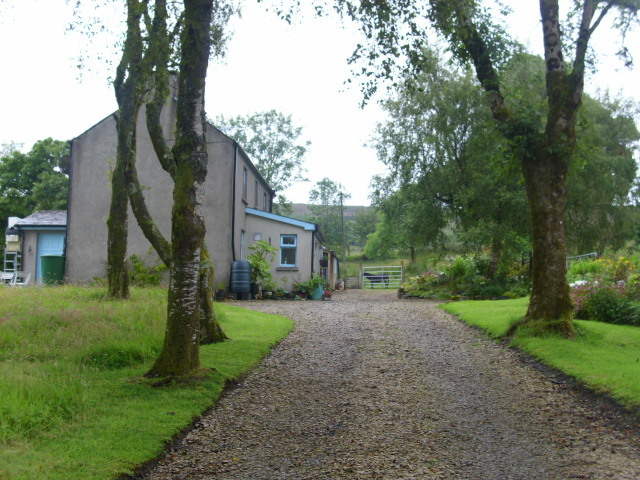 Looking back towards the house from the gate. The next post will show pics from the vegetable and fruit garden.